Director/writer: Francois Simard, Anouk Whissell and Yoann-Karl Whissell. The Kid (Munro Chambers) is a comic book loving teenage boy trying to survive in a '90s post-apocalyptic wasteland. This scavenger collects relics from the past, particularly '80s toys, pink flamingo lawn ornaments and comic books featuring his beloved superhero, Turbo Rider. One day, while hanging out at a playground, flipping through an issue of Turbo Rider, the Kid meets his leading lady. Apple (Laurence Leboeuf) is an irritating, quirky, fun-loving character with energy to burn who warms her way into the Kid's heart. Unfortunately, it turns out that Apple is a robot. At this time, humans and robots have been pinned against each other in Terminator fashion. Luckily for the Kid, Apple is a friendly robot, meant to provide companionship to lonely human beings. Despite their differences, the two end up becoming fast friends, and more. 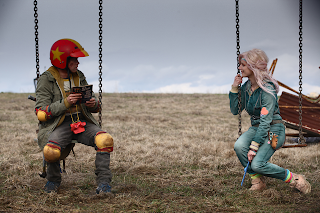 Turbo Kid and Apple share a swinging moment. Sadly for this duo, their relationship is doomed, much like the state of the world, as a lack of resources leads to violence and mayhem. This wasteland is being run by a gang of nasty thugs, headed by super villain, Zeus (Michael Ironside, Total Recall). Zeus has created a gladiator-type fighting ring where the loser's blood is harvested and repurposed. Along with their cowboy friend, Frederic (Aaron Jeffrey, X-Men Origins: Wolverine), Apple and the Kid get mixed up with Zeus and his gang, and find themselves in an all-out bloody battle that ends up being more of a personal vendetta. Thankfully, the Kid comes across a secret weapon, courtesy of Turbo Rider himself, that turns this teen into a force to be reckoned with. While the concept sounds exciting, the execution is uninspired. The film ends up coming across as a goofy, low-grade tribute to Mad Max, overstuffed with '80s pop culture references. The music from Montreal based electronic group LE MATOS gives life to the story at first but, by the end, it's overdone, becoming intrusive. On the plus side, the film looks pretty cool. 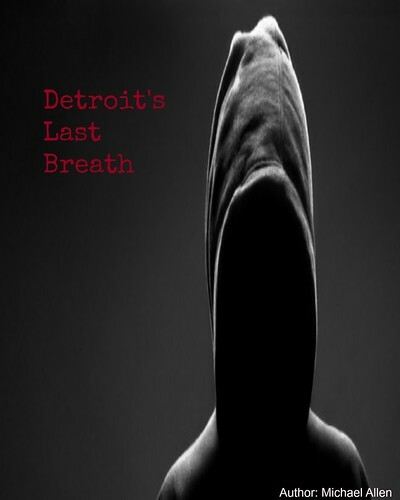 The gory B-movie style violence is thrilling, and the setting is incredibly effective. Filmed in Quebec, the rainy weather prompted a story transformation from a desert plain to a toxic acid rain-drenched wasteland. In turn, a perfect backdrop for the tale was born. This production is all about style, unfortunately at the expense of some other key elements including story structure and character development. Michael Ironside plays the main villain - Zeus. As mentioned, the story takes place in 1997. Dating a film is always tricky; not too many pull it off with great success. In this case, the filmmakers should have taken a cue from the much better apocalyptic film, Donnie Darko, allowing the story to reveal the time period rather than announcing it. This rookie move shows a lack of trust in the audience and a lack of confidence in storytelling. Also, the year 1997 isn't even significant to the plot or story. It seems that the filmmakers are simply making a case for using toys and gadgets that were popular in the '80s, like the Rubik's Cube, Walkman and View-Master. Another unfortunate aspect of the story is the two main characters, Apple and the Kid. These two lack chemistry, making the romantic part of the tale very bland. Also, Apple is extremely annoying. Upon the realization that she's a robot, that annoyance makes sense, but it's still painful to endure. The only real female characters in the film are a robot, a tough-looking villain who says nothing, and the Kid's dead mother who only appears in dreams. The story emphasizes the importance of a “man's personal bubble” so maybe they're trying to say something there. Even so, it was rather off-putting. 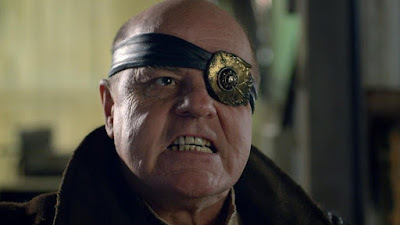 Thankfully, strong performances from Michael Ironside and Aaron Jeffrey make the film more tolerable, adding both dramatic and comedic elements. That said, it still falls short of being entertaining. 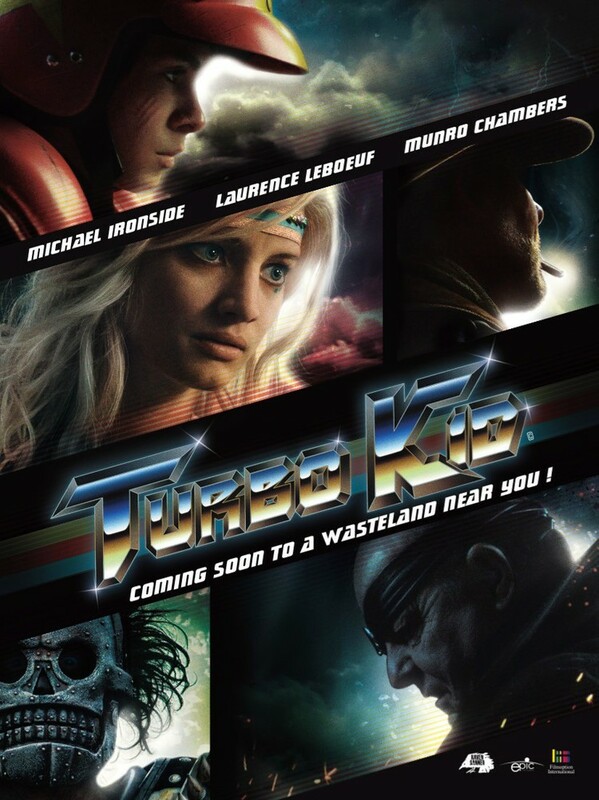 Turbo Kid is one of those films you really want to like, but it just doesn't deliver. For the most part, the characters are uninteresting and underdeveloped, and the story leaves much to be desired. While the film's gory elements may attract some horror and/or action fans, those looking for something intelligent and exciting will not be satisfied. The film is too busy stealing magic from other films and objects that they fail to create some magic of their own. There's something inauthentic about it. 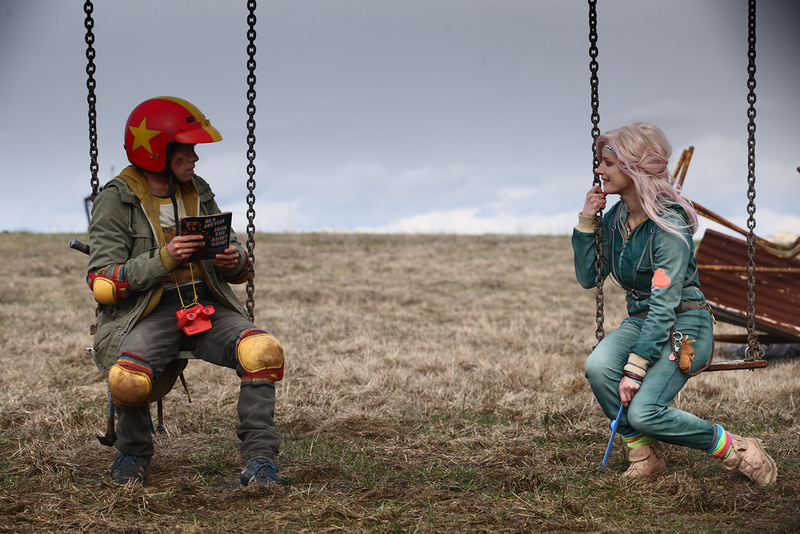 While Turbo Kid has aesthetic appeal, and possesses some nostalgic charm, the story simply lifts off, then touches down, without really going anywhere. Rating: 6/10 (a passing grade, based on cool effects, an awesome location and some solid acting). Kenna at Hey Kenna Rae!